I recently finished going through my novel Saga Terra: Odysseus with the help of Text Aloud and AutoCrit, and need a professional editor to go through the book to see things that need revision or I missed. I would be willing to pay. I know it's not been long since my last prompt call, but I wrapped that up in good time and am in search of more to do, so I'm throwing the gates open again, with a fresh batch for everybody who comments. Trying something a bit different, running it directly through my storyblog, in the hopes of streamlining future sessions. Description of Service: Reply to this page (no registration required) and leave me a prompt, on the theme "resolution." In return, I give you about 500 freshly-written words (475-600 to be specific) inspired by that prompt. Who is Elgible: Anyone. General guidelines are here. Date/Time Window: Now, until 5 PM ADT (or shortly after it) on the 11th of March, unless I get swamped in which case I may close early. I will try to keep sessions open as much as I can, so even this one may wind up being extended; I will attempt to launh a new session at the end of each month if all goes well. Tipping? Optional. Incentives mainly include extra word blocks (tripling the material you get if you make any donation at all, as well as another block per $5 CAD), and include some collective-total bonus words as well. I'm opening up another flash fiction call! Details below. Description of Service: Reply to this post and leave me a prompt, on the theme "renewal." In return, I give you about 500 freshly-written words (475-600 to be specific) inspired by that prompt. Date/Time Window: Now, until noon AST (or shortly after it) on the 17th of February. While I hope to get it going regularly, I don't have anything specific in mind that way so far. Tipping? Optional. Incentives mainly include extra word blocks (tripling the material you get if you make any donation at all, as well as another block per $5 CAD), and include some collective-total bonus words as well. $10 or more gets you a pencilled and lightly-shaded illustration courtesy of quoting_mungo. Nominations are currently OPEN for the 2013 Rose & Bay Awards. This award recognizes excellence in crowdfunded material. One of the awesome things about the crowdfunding business model is that it breaks the stranglehold of mainstream publishing. This encourages people to publish material on topics they love for niche markets that mainstream editors would never accept. Publishing is a popular category on the crowdfunding hubs like Kickstarter and IndieGoGo. What crowdfunded projects did you enjoy last year by or about furries? Who did the most positive and/or accurate portrayals of furries? 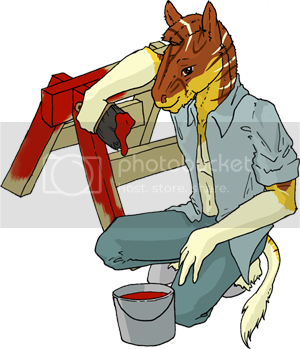 Which artists were doing fursona illustrations? Which writers were featuring anthropomorphic characters? Who hosted prompt calls where you could ask for anthropomorphic characters or plot motifs? Nominate them in the relevant category. Did you know folks who helped support those projects with donations? Nominate them as patrons! Please drop by to nominate your favorite crowdfunded projects from 2013. Post about the award in any relevant venue to help alert more people. I recently posted my short story, "Swallow the Sky," in which a thylacine shaman tells a war story to a rapt audience. It takes place in the land of Theas, which is loosely inspired by Australia, in the world of Quiar, a magical setting that I share with kajones_writing as part of her World Walkers collection. If you like audience interaction, check out all the crowdfunding options that kajones_writing offers. You can ask for and get more furry fiction by using the prompt calls or sponsorship or "write more" buttons. Aside from the explicitly anthropomorphic world of Quiar, this collection also has a number of additional furry races -- I particularly like the Nox Gadael, who are magical dogs. See "Taithmarin: Zoe: Meeting the Nox Gadael" for an introduction. Well, it's the end of the month. Time for another flash-fiction prompt call - and this time, I'm sufficiently caught up that my conscience will permit me to advertise it! Description of Service: Reply to this post and leave me a prompt, on the theme of beginnings. In return, I give you about 500 freshly-written words (475-600 to be specific) inspired by that prompt. Under the header A New Coat of Paint on an Old Saw I'm currently taking prompts for flash fiction (up to 1000 words) over in this journal entry. While the fiction's all written (of course), there are several art-related incentives should you choose to leave an entirely voluntary donation. Examples of previous flashfic I've written can be found over on my storyblog, and like these examples, all resulting fiction from this call will be posted publicly on Fridays by default, with the first piece being planned for this coming Friday. All prompters for whom I have contact information will, of course, receive their prompt fills as I complete them, (by default via LJ PM). This post is going up rather belatedly - on top of this month's session starting late; as anyone who watches my personal journal may be aware, my call has already been runnng. But since I didn't properly announce it outside of that, I'm going to be extending it. Anyway, this is my monthly prompt call for May; June's will come as usual at the end of the month. Description of Service: Reply to this post and leave me a prompt, on the theme of interpersonal relationships. In return, I give you about 500 freshly-written words (475-600 to be specific) inspired by that prompt. Description of Service: Reply to this post and leave me a prompt, in the form of a quote from someone (real or fictional), along with the speaker's name (and, if fictional, the work in which they said it). In return, I give you about 500 freshly-written words (475-600 to be specific) inspired by that prompt. Who is Elgible: Anyone, first-come-first-served to a total of 30 blocks of writing to do. Tipping? Optional. Incentives mainly include extra word blocks (tripling the material you get if you make any donation at all, as well as another block per $5 CAD), and include some collective-total bonus words as well. $10 or more gets you a pencilled and lightly-shaded illustration courtesy of quoting_mungo. Signal-boosts also earn a single extra block per person. Description of Service: Reply to this post and leave me a prompt, related in some manner or other to the equinox (autumnul or vernal) - the balance of night and day itself, or something related to it like planting/harvest or fertility. In return, I give you about 500 freshly-written words (475-600 to be specific) inspired by that prompt.